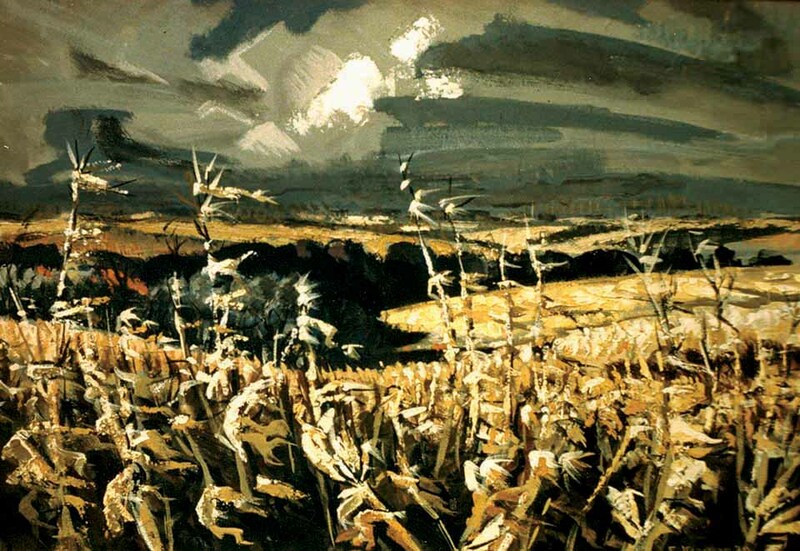 Like the "en plein air" painters of today, Eugene Kingman resonated with the spirit of painting landscape scenes (especially ones with corn) right on location in the fields outside of his home in Omaha Nebraska, where he was Director of the Joslyn Art Museum. This honored work was exhibited at the Audubon Artists' 19th Annual Exhibition in 1961 in New York City. It was later chosen by a jury for a 1970 calendar, sponsored by the Northwestern Bell Telephone Company. This painting, an oil on canvas, was painted in 1961 near Omaha, Nebraska during one of many Sunday "painting picnics" he and his family would enjoy. Later during 1969 Northwestern Bell Telephone Co. assembled a jury panel to select 12 Omaha artists to submit paintings that would be suitable for each month of the year. This painting was chosen for November in the published 1970 calendar.